Scottish Conservatives lose out but girl power reigns with 13 new female councillors voted into South Lanarkshire. UK Government decisions came back to haunt the Scottish Conservatives with the party emerging as the big losers at South Lanarkshire Council’s elections. The Scottish Nationalists gained four seats across the county, the Liberal Democrats lost one and the Labour party celebrated with an extra seat. However it was a bad day at the office for well-known Tory councillors John Murray, Clydesdale’s Alex Allison and Patrick Ross-Taylor who felt the backlash of the Conservatives’ cuts package. Girl power was that was the theme of the day with 22-year-old Lynsey Hamilton elected as a Labour councillor for Clydesdale West and 24-year-old Angela Crawley boosting the SNP’s numbers in Hamilton. Women were the real winners with more than ten new female additions to the chamber including East Kilbride’s Susan Kerr and Gladys Miller and Hamilton’s Monica Lennon. There were tears of sadness, shock and delight during what - on paper - seemed a rather anti-climactic day in South Lanarkshire, with turnout as low as 31% in some wards. With the John Wright Centre in East Kilbride packed with candidates anxiously awaiting their fate, Bothwell and Uddingston was the first area to be revealed at 10.38am and the results for the area’s 20 wards came in thick and fast until 3.30pm. Former Liberal Democrat MSP Robert Brown replaced retiring councillor Eileen Baxendale in Rutherglen South, in an area which had the election’s highest turnout of 42.85%. Eddie McAvoy, who steered the Labour council for the last five years, threw his hat back into the ring after being re-elected and admitted he would be putting himself forward as the party’s leader once again, and said youth unemployment and the Schools Modernisation Programme would be his priorities. There were gasps and shouts from the audience as Hamilton’s Barry Douglas lost his seat to fellow SNP candidate Lynn Adams, in what was the first big shock of the day. Lynn, owner of the George Bar, fought back tears as she stood on the podium and said it was a “bittersweet win”. 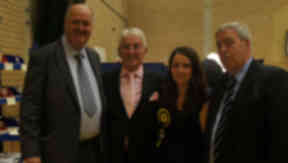 One councillor claimed just 18 votes separated Barry from newly elected Labour councillor Monica Lennon. In what had been a hotly contested ward, returning Labour councillor David McLachlan offered his commiserations to Barry Douglas but hit out at SNP activists. He said: “Straight away I did feel it for Barry, he was a good councillor, I really like him, I can’t say that for some of the activists within the party. In neighbouring East Kilbride, just 18 months on from a near fatal road accident, Gerry Convery showed he was back and fighting fit - securing another five years in East Kilbride South. Former MSP and Health Secretary Andy Kerr was there showing his support for his wife, new Labour councillor Susan Kerr. The first political upset came in Clydesdale West where long-serving Scottish Conservative and Unionist councillor Alex Allison lost his seat, but paved the way for new representatives SNP’s Pat Lee and Labour’s Lynsey Hamilton. Lynsey, 22, said: “It feels amazing, I’m so happy I didn’t expect to be here and glad I get represent my ward in the council and hopefully bring some fresh and young ideas. Back in Cambuslang, recognised councillors Walter Brogan, Pam Clearie, Russell Clearie, Clare McColl and Richard Tullett kept their seats with Liberal Democrats’ David Baillie losing out. Richard, who moved from Cambuslang East to Cambuslang West, said he was relieved and excited to be establishing himself in a new ward. There were three new faces in Clydesdale North after the Conservative councillor Patrick Ross-Taylor lost his seat to independent candidate Ed Archer, Labour’s Catherine McClymont and SNP’s Vivienne Shaw. And it was a double celebration for Vivienne whose campaign agent Bev Gauld, rushed from conducting a funeral to find out he had secured another five years in Clydesdale East. There was relief in Hamilton West and Earnock where John Menzies maintained the seat that he had won, just six months previously in a by-election, and was thrilled to be join Allan Falconer, Jean McKeown and Graeme Horne in the ward. Despite a strong campaign East Kilbride Central North did not go Green and existing councillors including Labour’s Chris Thompson and SNP’s Anne Maggs kept out the Scottish Green Party’s Kirsten Robb. In amongst the celebration Chris said he was disappointed with the turnout and number of spoil ed papers. The decision over the Dovesdale incinerator was a huge factor for voters in Avondale and Stonehouse with campaigner Isobel Dorman celebrating a victory alongside former Conservative councillor Graeme Campbell, who was ousted from his party and chose to stand as an independent. Graeme said it was a significant victory. He said: “I genuinely can’t believe that I got through. My community has always been first and I’ll work with whatever party is in control. “It doesn’t surprise that the Conservatives haven’t done well, at the end of the day they supported Labour, there were eight Conservatives, four voted Labour, four voted SNP for change, the four were enough to get Labour through. Dovesdale was a massive issue. It was not a good day for the Conservatives in Hamilton South where young SNP candidate Angela Crawley snared a win and said she was grateful for all who voted. The former chair of South Lanarkshire Council’s Planning Committee Graham Scott was the shock upset in East Kilbride South with new SNP councillor Gladys Miller picking up his votes.